Finally catching up with the updates and William's is the latest cab off the rank. He had never been shod so had fewer adjustments to make than the shod horses who come here. The angle of the photos makes it hard to compare - apologies, as the initial photos were taken while I was away - but although the heels look more under-run in the lower photo you can see by comparing the sole shots that this isn't in fact the case. William had a pretty good foot when he arrived - hoof wall and bars were a bit longer than he needed but he didn't need to make huge changes. Today, after a few weeks back in work, his feet look better with stronger heels, bars and frog, a tighter white line and better concavity. His palmar foot has improved too although as you can see from the caudal shots his media-lateral balance is not yet established on this foot. ...but the sole shots show more clearly what has been happening over the last few weeks. This foot has better medio-lateral balance and the frog and digital cushion are definitely working harder than they used to. Another belated update, but here are Dakota's 10 week photos, starting off with her worse foot, LF. She was as you can see unhappy to load it properly when she arrived. She has had ups and downs on this foot but is now landing heel first on it and is much happier to stand square. You can see the angle of the new hoof growth and that her hoof wall will be shorter and stronger once it has fully grown in. She is also building a better frog although again it will be another few months before the changes are complete. There is a significant difference in the strength of the palmar hoof - the digital cushion is less crushed, hoof wall is shorter and her frog is able to make ground contact as it should. This was a healthier foot to start with and so the changes are less dramatic but there is an improvement in the hairline, which no longer collapses towards the back of the foot. 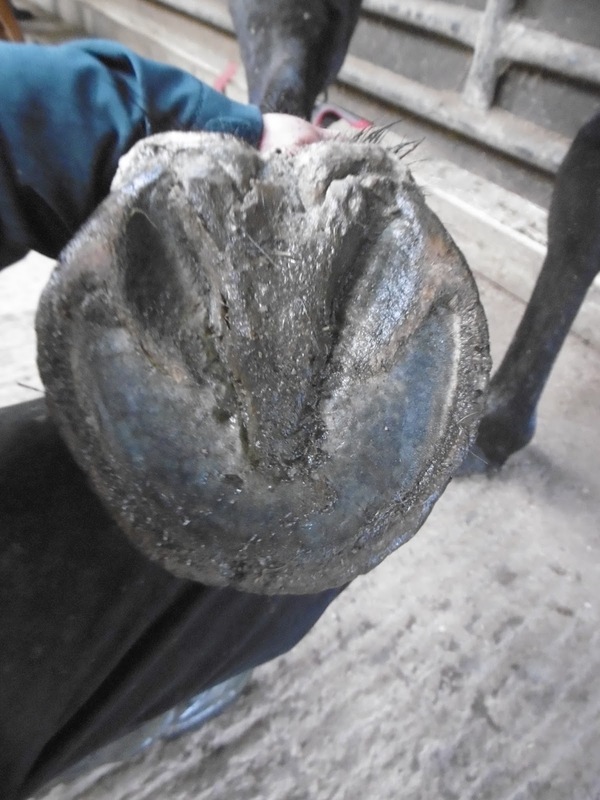 Again, there will be a shorter, stronger hoof capsule once the new growth is complete. Her heels still need to come back more and her frog will develop further but the sole and frog are already healthier and responding to better loading rather than the whole weight being confined to the periphery of the foot, as it was when she was shod. Nice to see a digital cushion and frog which are recovering! It never ceases to amaze me how they pop out and build up as soon as they are given the chance. Mordor has now been here nearly 12 weeks so another update is due. Contrary to initial impressions, Mordor's feet have not just become hairier in the time he has been here...! His landing has changed as well - I will upload footage later on - and he has gone from having a medio-lateral imbalance to having a much more balanced landing. He had a reasonably good foot in shoes but his toes have shortened and his heels come back since he came out of shoes. He has also developed a stronger frog and digital cushion, as you can see from this angle. Feather really doesn't help in hoof photos, for which I apologise. This is his weaker foot and on this foot his frog still has a little way to go before its as strong as his right foot. Teak will have been here 12 weeks on Tuesday and its her turn for a (belated) update. 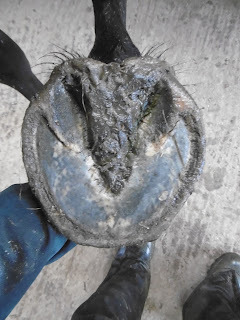 Not the best photo but she had very flat feet when she arrived which had under-run and lost concavity. She came out of shoes a short time before she came to Rockley; she had previously had some time barefoot but was in shoes most recently. This is her worse foot and as you can see she has developed better concavity as well as a clear heel first landing. 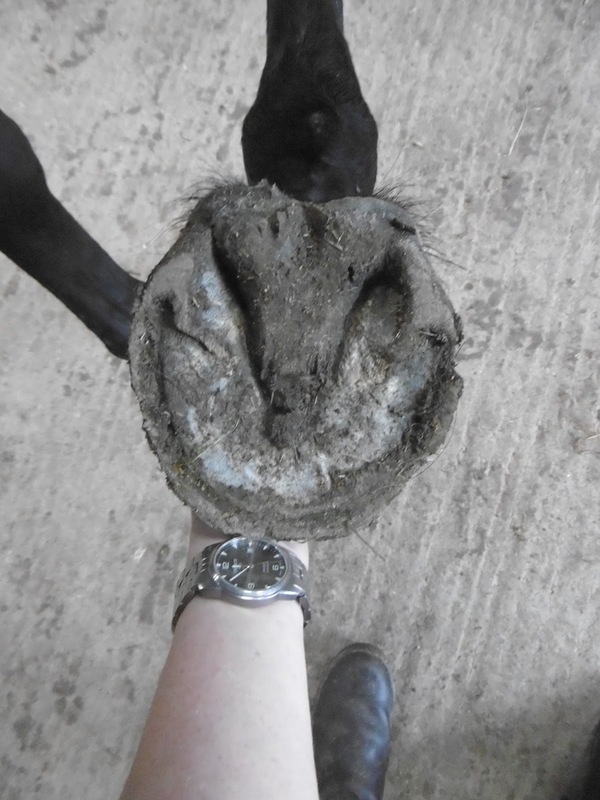 Her heels are still under-run - it will take at least another 12 weeks before she has grown in a full new hoof capsule. You can already see the changes in her feet but full concavity won't be there until the new hoof capsule is completely grown in. Recently out of shoes she had a long toe but you can see from the photo today that the new angle of growth will bring that in a lot shorter. Her heels look strange at the moment because the new growth hasn't yet reached the ground but once its there it will bring the back of her foot more underneath her. This was an even more collapsed foot than her LF but again the new hoof growth is clearly visible and will result in a shorter toe and more supportive palmar hoof once its fully grown in. 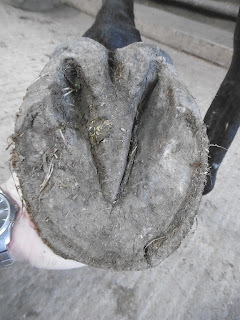 From this angle you can see that the palmar hoof is much more developed than it was on day one, even though it still looks under-run on the lateral shots. A stronger frog and digital cushion are very encouraging even though she has a way to go. As always, its important to assess feet from several different angles and not just rely on one shot to make your comparisons. Photos like these are helpful but only when you have already seen the horse move and how the feet are loading and landing. Finally, here we go with an attempt at a proper update. Ella has been here just over 12 weeks and is soon going home so this will be her final update most likely. As you can see, she arrived with very boxy feet and with a very pronounced toe first landing. If you look at the original photo there is also a clear difference between the under-developed palmar foot she had on arrival and where she is today. 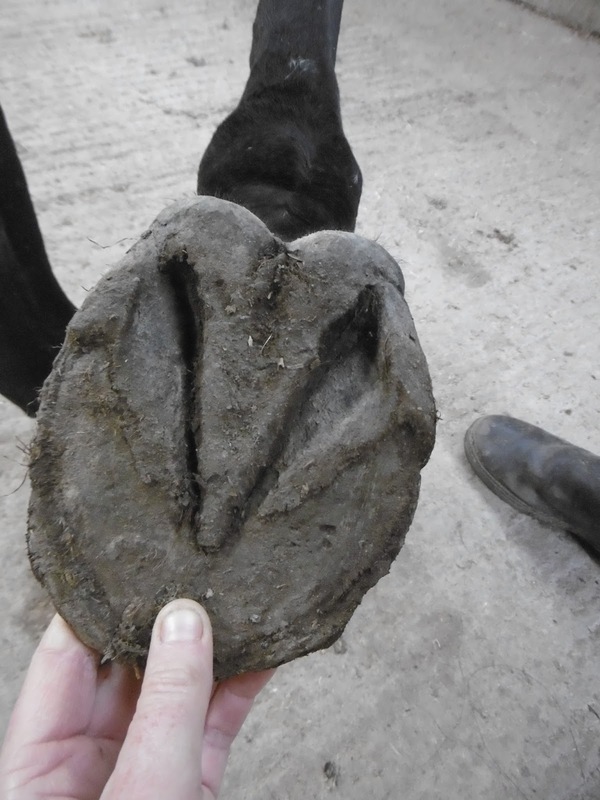 The new growth is obvious from this angle and reaches about two-thirds down but importantly the new palmar hoof capsule is already on the ground. Ella's landing isn't extravagantly heel first but she does now properly engage the back of her foot. The shorter toe she will have once the new hoof capsule has fully grown in will also help to keep her landing heel first. Same story on this foot and again the new hoof capsule growing in at a tighter, better connected angle is easy to see. 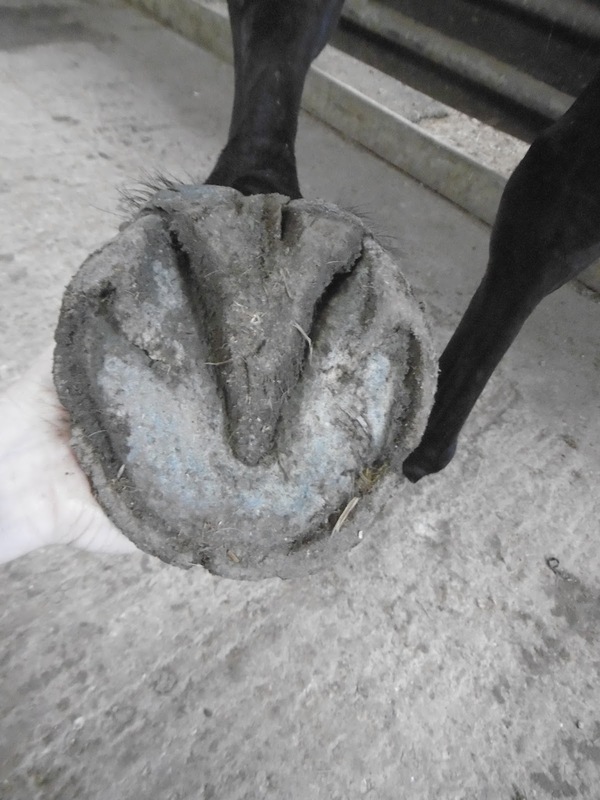 The temptation as ever for farriers and trimmers is to back the toe up but Ella is doing just fine on her own and by not overloading the palmar hoof before she is ready we will ensure she stays sound and able to continue work. What a difference between the length of hoof wall now and when she was in shoes! Its not the best photo angle but I hope you can also see how much more developed the heel bulbs and digital cushion are today. The photo above is the day she arrived and below is immediately after the shoes came off. Sorry - another of the irritations of this poorly designed photo software is that it doesn't recognise editing changes as soon as they are made. So this photo is, in the photo software, the right way up but its not uploading the current version...Still, with luck even if you have to crane your neck you can see that there frog and sole are healthier today than they were in shoes. From this angle you can see that the hoof wall, though a lot shorter than it used to be, is still long. The new hoof capsule will result in a shorter, better connected hoof but it will be another 6 weeks or more before this is complete. However the frog and digital cushion are already in much better shape. These photos again show her on arrival and immediately after the shoes came off (below). the current photo is the last one. Sorry - same problem with this photo but at least I've managed to upload some...More soon!